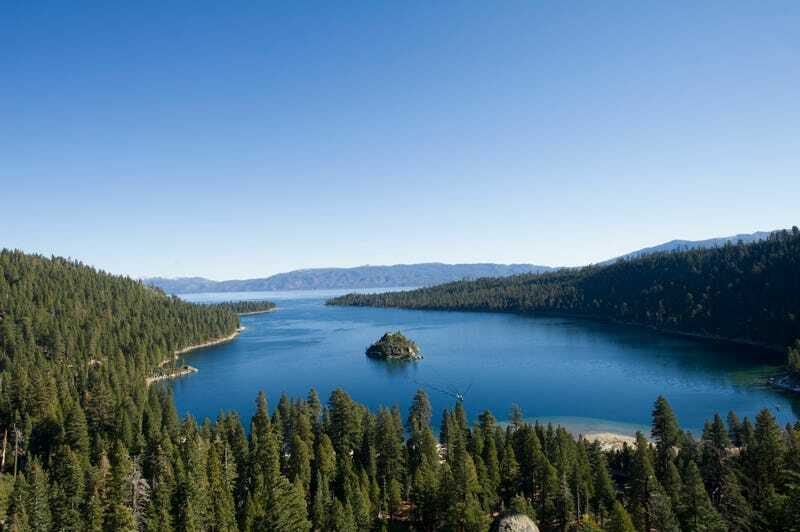 California’s Lake Tahoe is known for being blue—really, really blue. And for a long time people assumed that bright color was because it was so clear. We now know that isn’t the case after a study on the lake revealed something weird. Lake Tahoe is almost always very blue, but it’s not consistently blue—there are points in the season where it’s noticeably bluer than others. But, when a study from the University of California Davis looked at what else was going on when the lake’s color intensified, they found that it wasn’t when the lake was at its clearest. In fact, it was the exact opposite: When the lake was clearer, it got less blue. When the lake was less clear, the blue color got deeper. So what’s going on here? The responsible party is not clarity. It’s algae. When the algae levels are lower, the color intensity is higher. So when you stare deep into Lake Tahoe’s blue surface, you’re not seeing into the clear depths below, but rather the algae levels throughout.